There is a special need to be patient with others today. Saturn is moving towards a station, exact tomorrow, and Juno is stationary direct. Errors are likely. 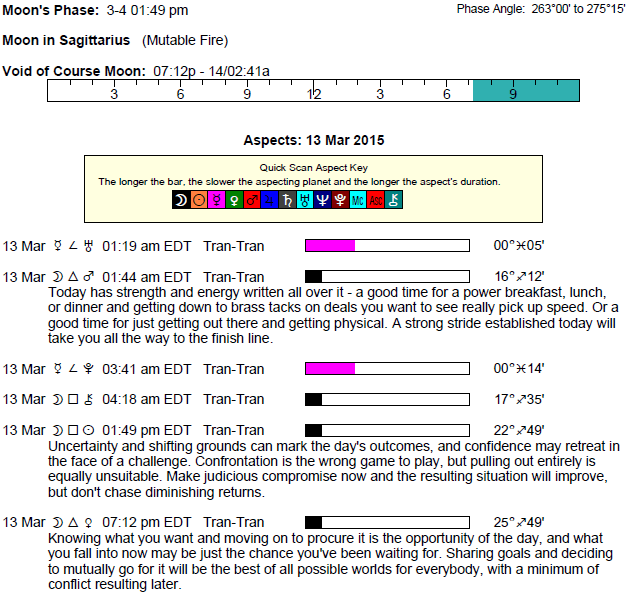 Mercury is challenging the Mars/Uranus-Pluto square, suggesting some impatience and tension. Capricorn-ruled areas of our charts can be under a fair amount of stress today and in the next few days with Pluto in Capricorn square Uranus and Saturn stationary. The Moon is in Sagittarius all day (until Saturday, March 14th, at 2:39 AM). The Moon is void from 7:11 PM (until tomorrow at 2:39 AM). 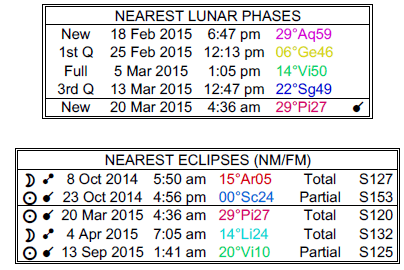 The Moon is in its Waning Gibbous phase until 1:47 PM / Last Quarter phase from 1:47 PM. A Last Quarter Moon occurs at 1:47 PM. Mercury spends its first full day in Pisces (Mercury transits Pisces from March 12-30). Saturn is stationary, turning retrograde tomorrow morning. With Saturn turning retrograde until early August, dear Aries, some of your plans might stall or require additional review before going forward. Motivation may be waning temporarily, or there could be some adjustments needed, particularly related to career, life direction, education, and publishing matters. Today, there is a tendency to make errors. There can also be rather heavy, serious energy surrounding your general direction in life not only with Saturn, the ruler of your career sector, turning retrograde, but also with Pluto in the same sector in difficult aspect to Uranus this week. Decisions, decisions, decisions! It’s not the easiest time to make them. On another note, there is wisdom to be found in your relationships. Conversations about your problems with someone special can open up possible solutions. Today and tomorrow can be temperamental in tone, dear Taurus. 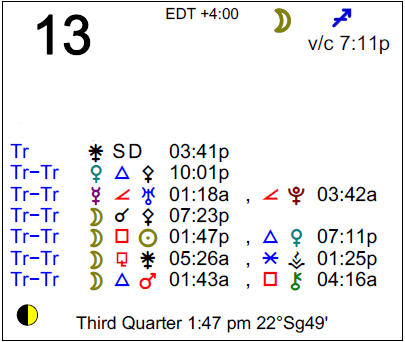 As well, there can be some heavy energy hanging in the air with Saturn at a station and turning retrograde. You are seeing people you associate with in a different light – perhaps a little more critically or with more discrimination. There can be a sense that others are not open with you or blocking your plans. Circumstances might conspire to remind you of the need for financial review. There can be concern about loans, debts, taxes, and shared income now. Some of you could be reviewing educational or travel plans, or dealing with delays in these areas. Your ruler, Mercury, is challenged today and tomorrow, dear Gemini, and this can point to a little more tension and distraction than usual. With Saturn stationary as well, decisions are difficult. On the one hand, you are in a rush, and on the other, you are undecided. Try to slow down and watch for errors. You are entering a period in which you may be reviewing or possibly questioning a partnership or a partner, or you could be taking a more serious and critical look at relationships. This is a time for re-assessing matters regarding your attachments to others, and particularly commitments or frustrations regarding same. Concerns about finances, debts, taxes, and shared money can be stronger now. Fortunately, there is also lighter energy when it comes to friendships today, and you might find that you can unload some of your concerns and problems with a helpful friend. With Saturn in your solar sixth house turning retrograde, dear Cancer, you are entering a period in which there can be some questions in your mind about your commitment to your job, whether it’s the line of work, the company you work for, or the tasks that are required of you. You will have plenty of time to think things through, so be sure to do so before jumping to decisions. There can also be some cooling off or settling in when it comes to a partnership over the next few months. However, with Pluto in your partnership sector in challenging aspect to freedom-seeking Uranus this week, there can be some frustration with how things are going with someone close to you, particularly if they are working hard to keep you from changing and growing. With Saturn, ruler of your work and health sector, stationing and turning retrograde, and Pluto in the same sector in difficult aspect with Uranus this week, dear Leo, there can be heavy energy surrounding your daily routines. Decisions may be difficult to make, and the tendency to make errors or to become frustrated quickly runs high. You are entering a period of review and assessment of your goals, and this can revolve around your commitments to work or certain elements of your work, health programs, creative projects, and possibly a romantic relationship. Decisions shouldn’t be rushed, even if the energy of the day seems a little frantic. Friendships can help take your mind off heavier subjects today. Saturn is stationary and turning retrograde, dear Virgo, and will travel in this apparent backwards motion until early August. Because Saturn rules your romance and creative expression sector and is currently transiting your sector of home and family, these areas of life enter a period of overall review and assessment. Some initiatives may slow down. Temporarily until you sort things through, some of your commitments could seem less meaningful, which, by extension, can make them feel more difficult to fulfill. Domestic chores or problems in the family dynamic can weigh heavily on your mind. It’s a time for going within and examining your intentions and frustrations. Some of you could experience a slowing down of a romantic affair during the coming months, and this gives you time to reflect and review or to catch your breath. Saturn’s retrograde lasts several months and occurs every year. The review you do during this cycle is a necessary, helpful process. However, in the week surrounding Saturn’s change of direction, including this one, responsibilities and pending decisions feel heavier. While we can feel a lot of pressure to get things done today, dear Libra, with Saturn stationary and about to turn retrograde, there can be a serious or intense tone to the day as well. You may feel some loss of interest or motivation when it comes to certain learning, creative, or mental interests and projects this week, but while you may decide to let go of certain projects, this period is more about making adjustments and re-assessing things. Some things might be put on a shelf, while others may simply need editing. There can also be heaviness surrounding home and family, as you could be in the position to make changes or decisions that don’t come easily. However, today there can be helpful conversations that involve bits of wisdom. Decisions shouldn’t be rushed now. Financial and business matters and issues of security and comfort can weigh heavily on your mind today and this week, dear Scorpio, with Saturn stationary and turning retrograde in your solar second house. This is an important time for getting your finances in order, but this may be a struggle right now with some waning enthusiasm or a feeling of being overwhelmed just for now. You need to stick to it, but you might also need to review and examine your attitudes, needs, and budgets. The coming months are strong for these things. It’s important this week to be extra careful with errands, transportation, saving your work, and communicating clearly, as the likelihood of making costly errors is strong. Saturn is turning retrograde until early August, dear Sagittarius. Currently, Saturn is in your sign, but in June will retrograde back into Scorpio. Saturn’s retrograde is a yearly cycle that points to a period of review. On one hand this can ease some of the pressure that is on you personally, but on the other, there can be a feeling of lack of connection with why you are making the adjustments and handling increased responsibilities that Saturn’s transit to your sign requires of you. This, by extension, can actually magnify problematic areas. The trick is to understand why Saturn is “testing” you and to go with it. You are maturing and learning that you can rely on yourself during this phase of your life. This is also a time for financial review, and you could find that you are more hesitant about spending money or making financial commitments during this period of your life. Today, you are expressing yourself in an especially appealing, likeable way. If you feel shake-ups in your home life these days, dear Capricorn, consider identifying areas that need changing and take it upon yourself to initiate making adjustments and improvements. It’s especially important that you avoid pushing yourself now with Saturn stationary and turning retrograde tomorrow morning. While this cycle lasts for some time, until early August, the shift of direction that is occurring now can be a disorienting time. You are a little more sensitive to Saturn as Saturn is your planetary ruler. It’s a good time for reviewing and reassessing your plans and goals, and not as ideal for pushing forward new ones. Thoughts tend to turn to past frustrations that are affecting your present. With the Moon in your privacy zone all day again today, you may be a little retiring and in need of extra rest or time and space to think. Saturn is stationary and will turn retrograde, dear Aquarius. This cycle that lasts until early August points to a period of review when it comes to your larger, long-term, life-plan goals and responsibilities. Your commitments or dedication to friends or group activities that you’re part of can be matters that you begin to question today and over the next while. You are now in the position to review what your friends or teams mean to you, ideally with the goal of improving your connections. Even though we may be a little more error-prone today than usual, it’s a good day for general cooperation with others, particularly if you aim to be especially clear when communicating. Saturn is stationary today as it is set to turn retrograde – a cycle that lasts until early August and that occurs yearly. This is a strong period for reviewing your goals, dear Pisces, and particularly your professional ones. However, it’s not ideal energy for pushing brand new projects ahead. This can also be a time when friendships are a little more complicated, and this adds to the week’s Uranus-Pluto theme that can also pull up underlying challenges with a friend or group. While all of this is on the heavy side, there are some brighter spots today as your ruler, Neptune, connects creatively with wise Pallas, suggesting some wisdom gained, and possibly shared, with people in authority. You may in fact be leading the way and playing role model today through your own special insight. If Your Birthday is March 13th, If Today is Your Birthday full horoscope here. We can be easily bored with the usual routine or bothered by overly traditional or what seems like limited thinking. This can be disruptive or it can lead to new ideas. There is intensity in our communications and thinking processes, which may be disruptive but can also lead to new strategies. Moon 05° Capricorn 45' 48"